This past week, Madeleine Ference ’16, Nitya Thakore ’16, and Aarathi Sahadevan ’16, students in Hathaway Brown’s signature Science Research & Engineering Program, traveled to Houston, Texas to compete in an international science competition. I-SWEEEP, The International Sustainable World (Energy, Engineering, and Environment) Project, is a groundbreaking science fair competition open to high school students from around the world. It is one of the largest science fair event of its kind, bringing together young scientists from more than 60 countries to present more than 500 projects. The mission of I-SWEEEP is to create a collaborative yet competitive environment in which students can present their innovative ideas on today’s challenges in energy, engineering, and the environment, and creating a more sustainable world for tomorrow. These HB students received all-expenses-paid trips to compete at I-SWEEEP as Finalists, having advanced through HB’s 17th Annual Poster Session judging. HB is awarded spots to I-SWEEEP each year based on the quantity and excellence of the science and engineering research that comes out of the school year after year through the SREP. 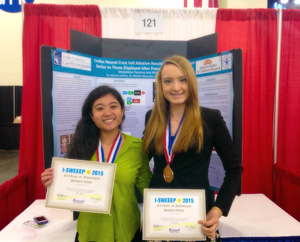 At I-SWEEEP, students are exposed to a five-day whirlwind of scientific, cultural, educational, and social events. The centerpiece of the competition is a full day at which each student's research project poster is judged in person by several professional judges. 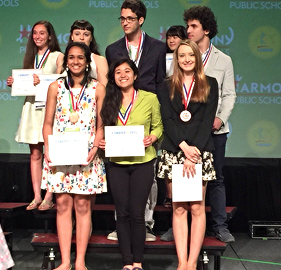 At the end of this year’s competition, the HB students each won bronze medals for their research representing the United States. 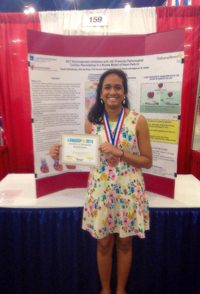 The students were at I-SWEEEP to present two separate projects: Madeleine Ference and Nitya Thakore conducted medical research in a team project through a lab at the Case Western Reserve University School of Medicine, and Aarathi Sahadevan conducted an individual research project also at the CWRU School of Medicine. To learn more about I-SWEEEP, please visit the organization’s official website. Congratulations, Madeleine, Nitya, and Aarathi!